Popularly known as the “Garden Island” or “The Garden Isle,” Kauai is the oldest geological island among the primary Hawaiian Islands. The fourth largest in Hawaii and the 21st largest in the nation, the island is blessed with a stunning landscape. The first island to have been discovered by the great English Explorer, Captain James Cook, it is highly believed that the origin of the island is accredited to a volcanic eruption around 10 million years ago. Whether it is your first trip to the island or your tenth, Kauai guarantees to keep you enchanted. Magnificent mountains, pristine beaches, dramatic skies, impeccable wildlife, and massive tropical rainforests – these are only some of the things a visitor to the Garden Island can hope to experience. Interestingly, Mt. Waialeale, with 450 inches rainfall each year, is considered the wettest spot on earth. Though the island of Kauai expands over an area of approximately 560 square miles, accommodation is restricted to only a few regions making it seem more natural and uncommercialized. That being said, there is no dearth of luxurious resorts and fancy hotels on the island. 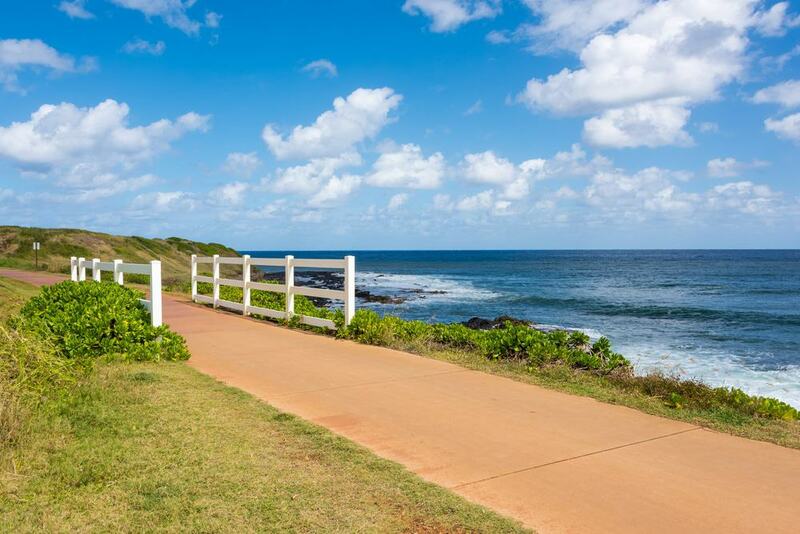 Let us explore some of the most popular areas of the island and see what they offer to make it easier for you to decide where to stay in Kauai when you visit. As you drive through the famous tunnel of trees to get to the South Shore, you immediately feel the beauty and romanticism of Kauai. Not as popular (and touristy) as the North Shore, the South is filled with pristine beaches and an array of activities on offer. 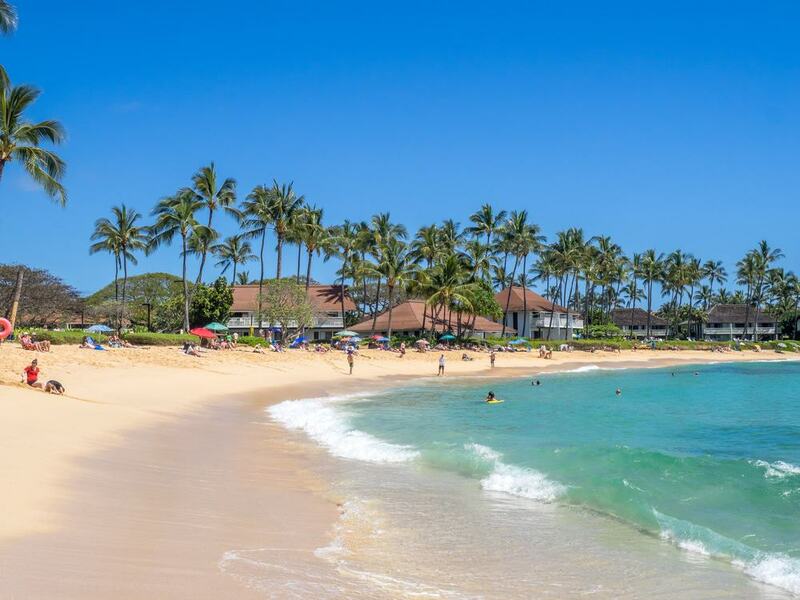 Poipu Beach is one of the primary attractions in the area and has been regarded as one of the best coasts in the country by none other than the Travel Channel. Miles of glistening golden sand and excellent water activities such as snorkeling, sailing, and paddle-boarding make the beach popular among visitors who aim to experiencing the best of the island. Fascinatingly, when you are in Poipu, you have access to not one but two beaches – a narrow sand spit (tombola) extends from the main shore towards a nearby island, hence giving you two equally wonderful beaches. Equivalently famous with humans and marine residents (such as Hawaiian monk seals), the area is also home to Poipu Beach Park, perfect for a complete day of sunning and picnicking with picnic tables, showers, lifeguards, and restrooms. Other Highlights: Spouting Horn, Shipwreck Beach, Makawehi Lithified Cliffs, Koloa Sugar Mill, Koloa Zipline Adventure, Koloa Zipline Adventure, and Lawai Beach. Koa Kea Hotel & Resort – Boasting an outdoor pool and poolside bar, an on-site restaurant specializing in Hawaiian seafood specialties, and lavish guestrooms with upscale furnishing, oversized windows, and premium toiletries, the boutique hotel is one of the top accommodation choices on Poipu beach. The in-house spa and wellness center offers a range of massages and treatments and can arrange for in-room and beachfront therapy sessions. Perfect for all kinds of luxury travelers. Koloa Landing Resort at Po’ipu, Autograph Collection – A short walk from the beach, this exquisite resort features a state-of-the-art fitness center, two resort-style pools, romantic torch-lit walkways, and landscaped ponds. Villas and studios here feature oversized windows, stone flooring, and spacious balconies with views of the ocean. Great for couples, families, and large groups of up to 6 members. 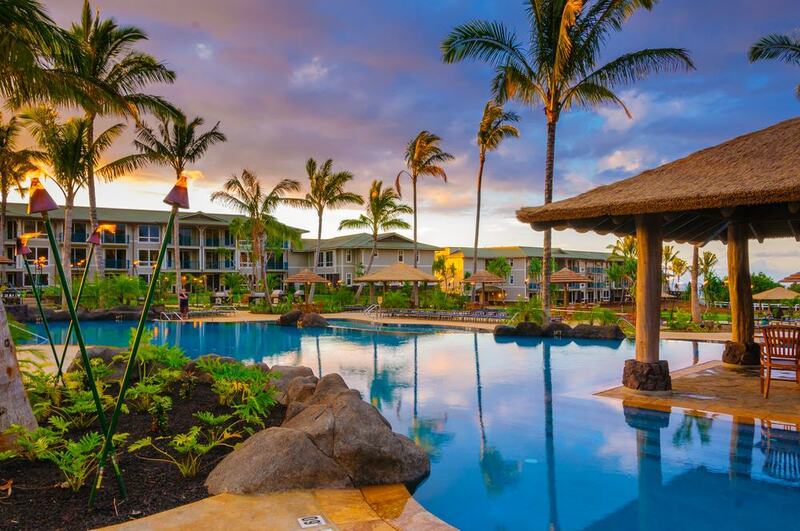 Sheraton Kauai Resort – A stone’s throw away from the beach, Sheraton Kauai Resort specializes in water activities, Hawaiian cuisine, cultural activities, world-class spa services, and excellent oceanfront dining facility with a view of the Pacific Ocean. Guests can choose to explore the many sightseeing spots around the property or relax at one of the two outdoor pools on-site. Great for all kinds of travelers. Located adjacent to the more prominent Hanalei Beach area, Princeville is an upscale neighborhood known for its upscale beachfront resorts and master-planned community of stunning houses and condos. Nestled mainly along Pali Ke Kua Beach (more commonly known as the Hideaways Beach), Princeville is perhaps most popularly known for Queen’s Bath. A massive natural pool sliced out of a lava shelf, Queen’s Bath has a bewildering marine life that can be seen even without goggles during summer months (it’s not safe during winters). Hideaways Beach, on the other hand, is surrounded by an enormous barrier reef which makes the location fabulous for swimming but beware! there are no lifeguards. Nonetheless, the beach is an amazing spot for professional snorkelers and has several interesting rock formations. Other Highlights: Kalihiwai Beach, Lumahai Beach, Kilauea Lighthouse, Waikapalae Wet Cave, and Manini-holo Dry Cave. Wyndham Bali Hai – Featuring a flat-screen TV with cable channels, a dining area, a balcony, and a tropical décor, the spacious, self-catering apartment units offers by Wyndham Bali Hai are situated within a kilometer of the famous Bali Hai beach. Guests at the property can unwind themselves at one of the two outdoor pools or soothe their mind and body in the hot tub. Sports lovers can enjoy a game of table tennis while the children play at the dedicated kid’s playground. Suitable for families and big groups of up to 6 members. Regis Princeville – Within a couple of minutes from the shore, St. Regis Princeville is a stylish 5-star hotel best known for its highly-rated golf courses, a superb spa and wellness center, exclusive gourmet dining, and a lush tropical landscape. Helicopter tours, sailing trips, and horseback riding can be instantly arranged by the hotel staff. Perfect for all kinds of luxury travelers. The Westin Princeville Ocean Resort Villas – A gentle stroll from the beach, the property comprises classy, self-catering villa units perched atop a cliff on the North Shore. Guests staying here can cherish their time at the outdoor pool and swim up bar or request for the complimentary shuttle service to take them to a nearby golf course and shopping venue. Great for all kinds of travelers. A picturesque coastal town along the crescent-shaped bay, Hanalei is undeniably the most popular area in North Shore as well as the island of Kauai. Expect to see an interesting diversity of crowd here – surfers, families, locals, and new-age folks – everyone seems to be loving the spot. Unlike most other areas in Kauai, Hanalei is not just a beach vacation destination. Surprisingly, the neighborhood is also home to several historic sites, fascinating art galleries, charming shops, and towering mountains with spell-binding waterfalls. While here you, of course, can’t miss a mesmerizing stroll along the iconic Hanalei Pier. When you are done taking in the views from the Pier, visit the emerald valleys of Limahuli Garden and Preserve, an unprecedented botanical garden spread across 17 acres of immaculate landscape framed by the Pacific Ocean and back dropped by the Makana Mountain. No wonder, the American Horticultural Society named it the Best Natural Botanical Garden in the nation. Other Highlights: Hanalei Valley Overlook, Mokuaeae Island, Haena Beach Park, Anini Beach, Hanalei Beach Park, and Tunnels Beach. Hanalei Colony Resort – Located right on the beach, Hanalei Colony Resort features luxurious suites with marvelous views of the ocean, an outdoor pool, an on-site bar and grill, and a complimentary shuttle service to take guests to and from Hanalei Town during the day. Hiking and snorkeling are really popular around the area. Suitable for all kinds of travelers. Hale Ho’o Maha Bed and Breakfast – Nestled a couple of minutes’ drive away from the snorkeling spot of Tunnel Beach, this boutique B&B property offers unique suites with a private balcony, flat-screen TV with cable channels, and free Wi-Fi. BBQ facilities are available on-site along with a sun terrace and a two minutes walking distance to Wainiha beach. Perfect for all kinds of travelers. Tutu’s Cottage – A charming holiday home with a well-manicured garden, free Wi-Fi, parking facility, and well-appointed units equipped with barbecue facility, terrace space, and a view of the garden or the surrounding mountains, Tutu’s Cottage is a 3 minutes’ walk from the beach. Horseback riding and golfing can be enjoyed around the property. Great for all kinds of travelers. An extremely touristy area, Kapaa, on the Western Coast of the island, is a lovely neighborhood, best known for its numerous accommodation businesses, eateries, tourist shops, and the “Sleeping Giant”. A name given to the stimulating formation of the Nounou Mountain range that can be seen from anywhere in the neighborhood. The Sleeping Giant is a part of Nonou Forest Reserve and is a very popular hiking trail. Ironically, the beaches in this region are less crowded than those in the northern part of the island – a valid reason for that could be strong currents in the waters here which make swimming and any such water activity quite dangerous. Flowing along the coastline of Kapaa is Kealia Beach. Made prominent due to its wicked waves, this beach is frequented mostly by boogie boarders and surfers. Other Highlights: Kamokila Hawaiian Village, Keahua Forestry Arboretum, Ninini Point Lighthouse, Sleeping Giant, and Uluwehi Falls (aka Secret Falls). Kauai Shores Hotel – Boasting private beach access, an oceanfront restaurant, a 24-hour reception, and a 6-acre tropical space with two outdoor pools, Kauai Shores Hotel offers expansive and elegant guestrooms with avant-garde facilities and gorgeous views of the ocean, swimming pool, or the garden space. Great for all kinds of travelers. Hotel Coral Reef – Situated near the historic Kapaa Town, Hotel Coral Reef benefits from a striking oceanfront location and lagoon-style pool that offers unparalleled views of the sea. Rooms at the property are fitted with an abundance of luxury amenities, including a spa bath, a private pool, barbecue facilities, and a balcony with spectacular vistas. Suitable for all kinds of travelers. Courtyard by Marriott Kauai at Coconut Beach – Situated directly on the beautiful Coconut Beach, this ritzy, beachfront hotel comes with an extraordinary restaurant and lounge, an extravagant spa and wellness center, and brightly decorated guestrooms with a private balcony and premium amenities. Perfect for couples and families. The second largest town in Kauai, Lihue literally means “cold chill” in the local language. Despite its size, the population is half of its touristy neighborhood of Kapaa. If you start missing your city comforts while vacationing in this tropical haven, Lihue’s K-Mart, Walmart, and Home Depot will give you an instant feeling of home. Home of the only airport on this paradisiacal island, the neighborhood is also the county seat of Kauai and comprises several government establishments. Popular activities in the area include body surfing, swimming, surfing, and stand-up paddle boarding. Another notable attraction in the region is the Ninini Beach and its automatic Lighthouse that has been in operation since 1897. We should also mention Alekoko Fishpond, a 1,000-year-old Hawaiian aquaculture reservoir which is regarded as one of the finest on the island. Other Highlights: Pearl Harbor and USS Missouri, Waimea Canyon, Nawiliwili Harbor, Lydgate Beach, Wailua Falls, Wailua River, and Waialeale Blue Hole Hike. Kauai Beach Resort – A short walk from the beach, Kauai Beach Resort is an affluent beachfront resort spread over 25-acres of extreme luxury and remarkable beauty. Start your vacation with a welcome drink on your arrival and enjoy a refreshing swim at one of the four pools before you select from an exclusive drinks & food menu at one of the hotel’s 4 eateries. Great for all kinds of travelers. 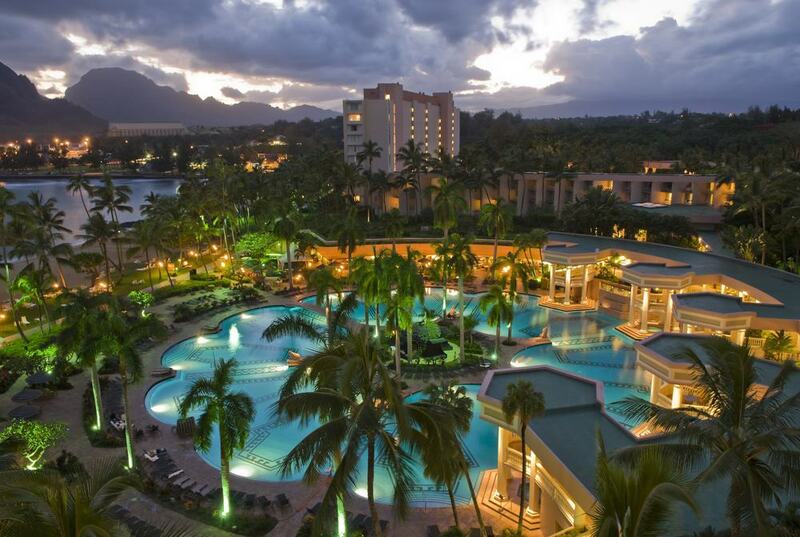 Kauai Marriott Resort – Located next to 18-hole Kauai Lagoons Golf Club, Kauai Marriott Resort features world-class hospitality and amenities, including a delightful outdoor pool, a full-service spa and wellness center, a state-of-the-art fitness center, and 5 restaurants. Business travelers can utilize the well-equipped business center. Perfect for all kinds of travelers. The Kauai Inn – Set within a plantation-style property surrounded by swaying palms and lush mountains, the Kauai Inn features airy, tropical guestrooms with free Wi-Fi, cable TV, and private bathroom. Swim in the outdoor pool or enjoy surfing and fishing at Nawiliwili Bay. Lihue Airport is within a 5 minutes’ drive from the property. Suitable for all kinds of travelers. The least frequented region in Kauai, the West Coast remains largely untouched by urbanization and tourist businesses. About an hour’s drive from the East Coast, this is where you visit for a chance to experience the unmatched natural wonders of the island. Despite its not-so-long distance from other parts of the Island, Waikoloa, along with the rest of the funky small towns of the Western Shore, feels like a world away. The most famous and breathtaking attraction in the area is the Waimea Canyon. Often dubbed as “The Grand Canyon of the Pacific,” Waimea offers you countless scenic lookouts and hiking trails along with a jaw-dropping view of its valleys that are as deep as 3,600 feet into the earth – you will not see another site like this in the entire Hawaiian archipelago, let alone Kauai. Other Highlights: Pu’u o Kila Overlook, Waimea Canyon State Park, Koke’e State Park, Alaka’i Swamp Trails, and Polihale Beach State Park. Mauna Lani Bay Hotel & Bungalows – Nestled along the white-sand beaches along Kohala coast in Western Kauai, this beachfront property comprises 2 restaurants specializing farm-to-table Hawaiian delights, a spa and salon with a meditation pavilion, and 2 championship golf courses. Other facilities include a fitness center, bicycle rentals, and beach cabanas. Suitable for all kinds of travelers. Kings’ Land by Hilton Grand Vacations Club – Offering free transport services to Waikoloa Village, this astonishing vacation property refines luxury with its fabulous on-site facilities and services, including a well-equipped fitness center, 4 outdoor pools, an activity center with video games, and an on-site restaurant. Great for all kinds of travelers, including big groups of up to 6 members. Hilton Waikoloa Village – A stone’s throw away from the beach, the Hilton Waikoloa Village welcomes guests to rejuvenate amidst a 64-acre oceanfront property featuring tropical gardens, three swimming pools, two world famous golf courses, a full-service spa and wellness center, and most interestingly, a saltwater lagoon with dolphin encounters. Perfect for all kind of travelers.